One of the most common jigs for a table saw is definitely the crosscut sled. It allows you to make accurate and safe crosscuts for boards or panels wider than even most sliding miters saws can cut. There are literally a million different designs and styles of crosscut sleds that can be found with just a quick internet search. 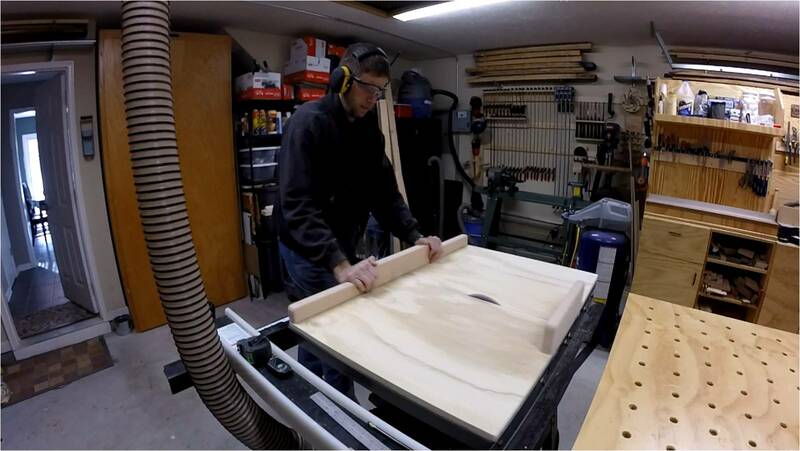 But basically it is a board that has two runners that ride in your table saw’s miter slots and has a fence which allows you to make accurate cuts. This jig like most jigs needs to be customized to fit your specific tool. The measurements here are what I used so it fit my table saw. I start off by cutting down a piece of 3/4 plywood to the size of the top of my table saw. My saw top is roughly 40 1/2 inches by 27 inches. You can use 1/2 plywood or MDF (Medium Density Fiberboard) also but I picked to use what I had on hand. I used my track saw to rough cut a piece that was a manageable size and then cut it to final length and width on the table saw. Once I had my plywood cut down to size it was time to make the hardwood runners that would slide in the miter slots. It is best to use some kind of stable hardwood so that your sled will be and retain its accuracy and how smooth it rides in the miter slots. I am making my runners out of oak I had left from a previous project. I cut them to length first on the miter saw. It is important to have your runners as accurate as possible and to do this I take it over to the jointer to joint one face and edge of the board. Once the board is jointed and I have to edges that are 90 degree of each other I prepare to cut them to their final height and width on the table saw. But before I do that I get my digital caliper out and get the measurements of my miter slots. Next I cut the board to width to perfectly fit in the miter slot. It is safer to creep towards that perfect cut than to try and get it right on the first cut… don’t ask me how I know this. Once it perfectly fits in the miter slots I will cut it to the depth of the slots. Both runners will be cut from this one piece of oak. Once both runners are finished it is time to attach them to the base. I like to put a couple washers in the miter slots to lift the runners up just a little about the top of the table of the saw to help with the alignment and ensuring a good tight glue up. I then place the runners in the miter slots setting on top of the washers and align them with the front of the saw. It is now time to glue the base to the runners. I use a small bead of wood glue along the entire length of both runners. I then place the base onto the top of the runners and line it up with the table top. This is one way why I made my sled the same dimensions as my table saw top. The closer you get this to being perfectly aligned now will make it easier later one when we go to line up the fence. Once you are satisfied that you have everything lined up it is time to apply some pressure and let the glue dry. One thing I seem to have plenty of in the shop is paint cans so I put them to good use. Once the glue dries I drill and countersink some holes along the underside of the runners to give them some additional strength. Make sure you countersink them below the surface of the runner so they don’t scratch up your miter slots. Now that the base is together you can set it back on the table saw and raise the blade to come through the base. Do not cut it the entire length of the sled yet until you attach both fences. This is just to help later when you go to align the fences. You can set the base aside and start getting your stock ready for your back and front fences. I had some oak that were the stringers from some rather large pallets left over that were perfect for this. There are many different options to use for your fences as long as they are straight and preferably stable. I cut a 40 1/2 inch piece for the back fence and a 14 1/2 inch piece for the front one. Because this rough cut lumber I have to joint and plane them. Just as I did with the runners I take it to the jointer to joint one face and one edge of the board. Then it is over to the thickness planer to plane the opposite face parallel. I try and keep the board as thick as possible by only taking off as little material as needed. I then take the two fences to the table saw and rip them to width. Once again I try and only take off as much material to make the edge parallel to the other edge. To help with the build up of saw dust against your front fence that could throw of the alignment of the work piece sitting on your sled, it is good to cut a 45 degree chamfer along the bottom inside edge. Now that both fences are prepared it is time to do a little shaping. I decided to cut out an area for my hands when using the sled. This will help keep my hands and fingers away from sharp spinning objects. I used the band saw to cut out the shape and then the oscillating spindle sander to clean up the saw marks. I just rounded off the corners on the back fence. To make it a little more comfortable I use a round over bit in my router table to round off the edges of both fences. Make sure that you don’t round over the bottom edges that will be connected to the base. Now over to my multi-purpose table for a little more sanding. The next step is probably the most important one. It is time to align the front fence and attach it to the base. I use a large framing square to align the front fence and make sure it is 90 degree to the blade. There are several methods out there to make sure the fence is perfectly online but I have used this method several times and have had great results. The most popular method of squaring your fence is the five cut method which you easily find several videos and articles describing this in detail. Once you align the fence it is best to clamp it down and then check the alignment again. It is easy to knock it off while clamping it. Then I flip it over and drive multiple screws into the fence through the base. The other fence can be lined up to the back edge of the base since the faces purpose is to keep the both sides of the base stable once you cut through it. Now that everything is attached there is just a couple more steps. I like to do just a little final sanding to break all the edges and round off the corners. Place the sled in the miter slots and and push it cutting the base the entire width of the sled. Only raise the blade as tall as you think you will need. This will keep the fences stable and keep everything aligned. To help your sled slide smoothly over your table saw I use a paste wax to wax the bottom of the sled. Some people only wax the runners but I have found that waxing the entire bottom of the sled helps alleviate any friction. This a worth while use of an afternoon that can help you with safe and accurate crosscuts on your table saw. I made a very simple crosscut sled but you can add a bunch of options from blade guards to stop blocks. I hope this helps you make your custom crosscut sled and I’d love to see pictures of what you come up with. Posted in Project and tagged cross cut, jig, sled, table saw, woodworking. I sure wish more people would leave photos, measurements or patterns for all these wonderful projects. I need a good sled and will use your method, thanks…I can’t even keep my wallet as organized as your shop, how do you manage that and get anything done?? Having an organized shop is the only way I can get anything done…. I’m not as productive in a messy shop. Thanks for stopping by and I’m glad you found my article useful. Hello, thank you for your excellent post!!! 1) Could you please advise on what “paste wax” you had used (brand, store, etc.)? 2) If I have a need to cross cut 24″ long stock, do I need to have at least 24″ long front fence to the right of the blade path? 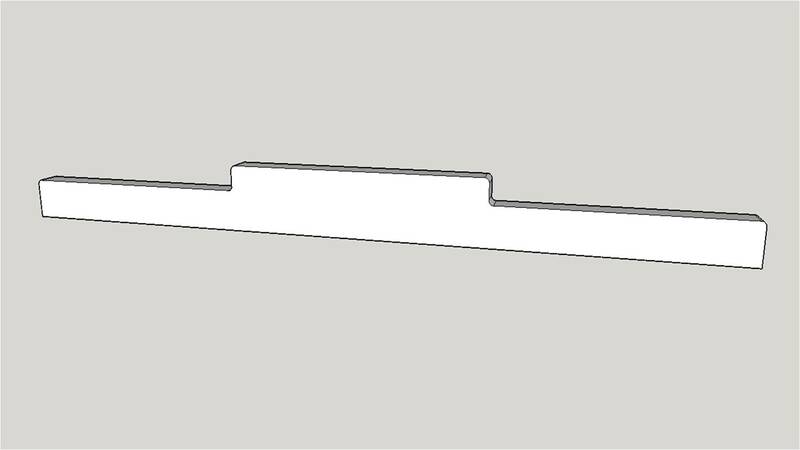 3) Would you recommend to use Aluminum runners inside Aluminum miter slots? or should I use the hardest wood available for the runners? 4) If only one runner is used, then the bottom of my sled becames sliding surface along the table saw, correct? Max, here are my attempts at some answers. 1. There is several different brands that makes furniture wax or you can use a general purpose paste wax like from the SC Johnson company. 2. The wider the crosscut sled the more board that it will support… but you can have longer boards that just hang over the left and right of your sled. The width is where it becomes an issue just because with this style of cross cut sled you have a front and rear fence. I have see some sleds that only have a rear fence. 3. I know there are several companies that make aluminum runners and I’m sure that will work but I have also see people use plywood for their runners and have said they had no issues. I think the most important thing is to use a stable material that is dimension ed to fit your saws slots. Some woods will have a movement issue depending on the humidity in your area. 4. The bottom of the sled should be the sliding surface for all sleds. That is why when I attached the runners I used washers to lift them up from the bottom of the miter slot. The runners then only act to make sure the sled travels in line with the miter slots to keep your cuts accurate. Hope this helps and feel free to shoot me a message with any other questions.